Medelco's Glass Electric Kettle offers unprecedented value. Features include: 1.75 liter capacity; safety auto shut off; on/off indicator light/ hinged locking lid; 360 degree swivel base for right or left hand use; ETL/CETL certification; lab-quality boroscilicate glass; BPA free; and concealed elements for easy cleaning. Watch as you brew fresh, hot coffee with our 8-Cup Glass Percolator. This superior coffee percolator is made from lab quality borosilicate glass. Our percolator comes complete with the stem, basket, basket lid, lid, and trivet - everything you need to get a pot of coffee going on your stove top. 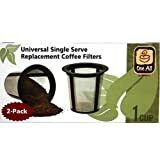 10 Cup, Universal Replacement Glass Carafe, Eurostyle, Pause & Serve, Fits Black & Decker #'s DCM900, DCM90WH, SDC1, SDC2, SDC2A, Bunn #'s A10, B8, Pour-O-Matic, Braun #'s KF40, KF400, KF450, KF600, KF800, 4085, Krups Model #'s 140, 149, 150, 171, Mr. Coffee #'s AD10, CBS700, CBS900, CMX1000, CM15, CMX20, CMX500, CM10, IDS12, PR15, US001, UTC100, UTC303, Norelco #'s CT162, CT66EB, Proctor Silex #'s A100, A301, A302, A306, A416, A600, A6078, A607A, A617, A625, A635, 44401. 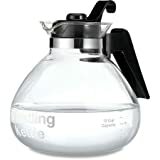 Medelco 12-Cup Glass Stovetop Whistling Kettle12-cup Whistling Kettle Made of Thermal-shock-resistant Borosilicate GlassRemovable Lid; Heat-resistant Phenolic Handle; Drip-free SpoutCan Be Used On Gas Or Electric Stovetops; Dishwasher-safeIncludes Metal Heat Diffuser For Safe Use On Electric Range CoilsProduct Built To North American Electrical StandardsMedelco 12-Cup Glass Stovetop Whistling Tea Kettle. A Great Way To Boil Water For Tea; Coffee; Cocoa; Soup; And MUCH More. Made From Lab-Quality Boroscilicate Glass With A Heat-resistant Handle; The Kettle Is Designed For Use On Any Type of Stove; And The Classic Design Works Well With Any Decor. This One All 12-Cup Whistling Tea Kettle can withstand high variations in temperature and is dishwasher safe. This whistling tea kettle has a 12-cup capacity with a heat resistant phenolic handle. The Medelco tea kettle can be used on gas or electric stove tops and comes with a whistling lid and metal trivet. Be able to have tea at any time of the day when you use this kettle. Keep the tea inside warm while you drink. The whistling spout lets you know when your tea is ready to be served. This 12 cup stove top whistling kettle is the immaculate product for boiling water. Made from high quality borosilicate glass from Germany, this kettle is suitable for use on your electric or gas ranges. This 12 cup stove top whistling kettle is the superlative product for boiling water. Made from quality borosilicate glass from Germany, this kettle is suitable for use on your electric or gas ranges.